We’ve all seen the cutesy quizzes that make their way around Facebook, especially with the holiday season just past. While you may be tempted to discover your ‘elf name’, law enforcement officers are warning you should think twice before taking the popular quizzes as you may be setting yourself up for identity theft. The quizzes seem completely innocent, but police are warning users that they could be anything but. Designed in a fun and whimsical way, they draw you in with a false sense of security, after all, how dangerous could it be to discover your ‘superhero name’. But take a step back and consider the information that you are putting out there publicly. If someone were to take the time to trace your name backward, it may reveal the month and day of your birthdate. Due to the fact your Facebook account is associated with the answer, the now also have your name and any other information also available on your account (like your hometown). This information could be enough for someone to steal your identity! What about the posts that ask for your first pet’s name or the street you grew up on, surely those are safe right? 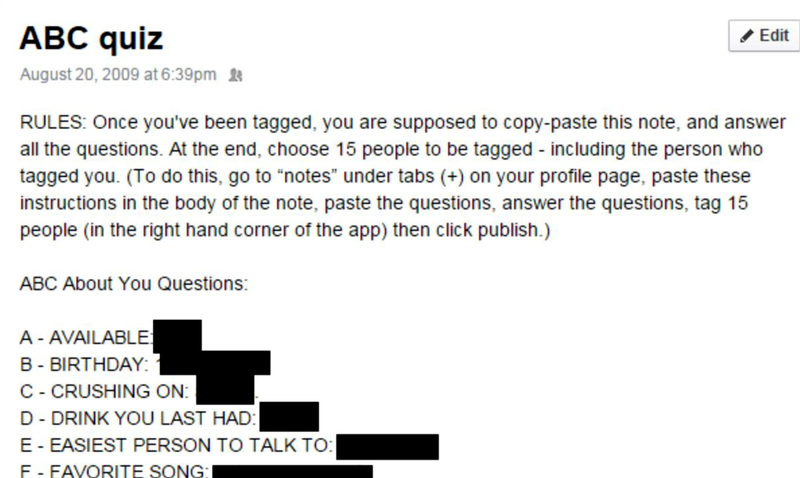 After all, they aren’t actually asking you to share any specific personal information… Experts warn that the questions selected for these quizzes aren’t as random as they may seem. These are pieces of information that are often used in the creation of passwords and security questions, helping thefts to hack into your accounts and access the information that they are seeking. You have likely heard mention of identity theft in the past, but you may not be aware of just how serious this can be. Using your personal information, thieves can open credit cards in your name, fail fake tax returns, make large purchases like buying properties, and more. For most who fall victim to identify theft, this results in months or even years of identifying and shutting down false accounts, re-establishing your credit and taking your identity back. That doesn’t even take into consideration the emotional and psychological goal, with many victims reporting incredibly high-stress levels, depression, anxiety and feelings of extreme vulnerability. Don’t believe that it can happen to you? Experts say that there is a new victim of identity theft in the United States every 2 seconds, revealing just how incredibly common it actually is. In 2017, that boiled down to 1 in 15 people falling victim to identity theft at some point that year alone. 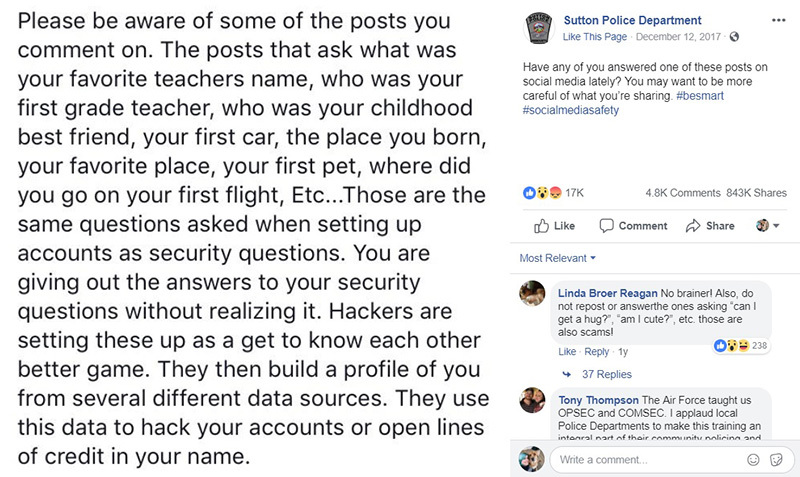 In response to a number of incidents that year, the Sutton Police Department in Massachusetts took to Facebook to warn the public about the risks associated with these quizzes. While the post may now be a year old, it is just as important and relevant today. The next time that you see these quizzes circulating, approach with caution! Not only should you not answer the questions they are asking, do your loved ones a favor by sharing this information with them as a word of caution. No one deserves to fall victim to these sneaky criminals.